The NEW Nimble by Balance Bar is on a mission to provide women with essential nutrition and a beautifying boost. That’s why our 120-calorie, on-the-go bar is crafted with Truvia® brand sweetener, and combines essential ingredients like FloraGLO® Lutein and Beta-Carotene for your skin, plus 7 critical nutrients for women’s bodies. Finally - a delicious energy bar developed specifically for women that feeds your body while nourishing your skin. The flavors available are Yogurt Orange Swirl and Peanut Butter. I like the fiber to sugar ratio and the fabulous melt in your mouth texture, almost like a taffy (or the candy Charleston Chew!). I think it can only be described as luscious. The peanut butter flavor has a very rich peanut butter flavor. I liked the outside, it did not have any odd after taste and was really delicious. I finished eating it in the car while I was on my way to pick up my children from school. I usually get really hungry right around that time and I need something to stick with me until I finish cooking the evening's dinner. The Nimble bar definitely left me satisfied...if only it were larger though, I really wanted more when I was finished. Yogurt Orange Swirl is just as tasty as the name sounds. My husband even took one of these for himself and when he was done he was asking what it was, where it came from and how we could get more! LOL He had no clue I was reviewing them or that they are supposed to be for women. The orange creamsicle flavor was really nice and the yogurt coating was good too, I just think that there should be a bit more orange flavoring in there because it was a bit week for me. The aftertaste was a bit vitamin-y to me. Now one thing I have to say is watch out, these bars can and will make you gassy. If you plan to eat one and then work out an hour or so later you might want to take some air freshener along, no joke! A quote from nimble bar, "The folks at Balance Bar were concerned about the gas issue, so we just want to assure you that everyone digests food a little differently and fiber can sometimes be a contributor to gas and bloating. Undigested carbohydrates become fermented by normal bacteria found in the colon and can cause these issues. If nimble fiber is a sensitivity, we would suggest trying half a bar before workouts to minimize any discomfort." I did feel like my energy was restored after consuming one bar and it seemed like it agreed with my blood sugar, I felt no surge of a sugar rush. I am keeping mine in the fridge because I think they make a great cool snack when it is warm outside. 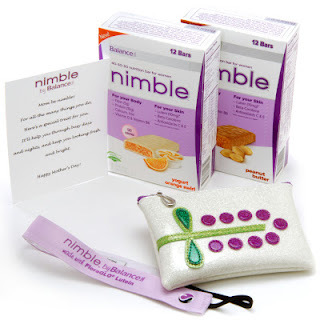 The Nimble Balance Bar (www.balance.com) is he first bar for women that combines nutrition and beauty. The Balance Bar Mother’s Day Gift Set is perfect for active, on-the go moms who appreciate the right combination of great taste, healthy nutrition, energy and convenience. • a special poem for mom printed on a nimble note card. The Gift Set -- valued at $54.98, and selling for the introductory price of $33.98 – is tied in satin ribbon for an extra-special presentation and is neatly boxed for free shipping. To WIN this gift set right here on Mama Nibbles you may enter into the Rafflecopter form below. Entry is only available for US residents only.